September 30, 2015, 7:19 p.m.
Attitudes to morality vary widely across time, place and belief but the central struggle between good and evil is a story as old as humanity itself. Even as modern thought begins to evolve past the idea of inherently &apos;good&apos; or &apos;bad&apos; people, our world is still a product of all the good and evil which has preceded us. YouGov&apos;s latest research shows that nearly half of the American public (45%) believe that bad people are quite rare, and make up less than 30% of the population. This is the most commonly held belief. A further 18% say that between 31% and 50% of Americans are bad, while only 25% of the nation believes that most Americans are bad people. This is still markedly higher than in other countries: in the UK only 12% of people think that most Britons are bad people, while 22% of Germans think most of their countrymen are bad. Overall 60% of Americans think that there are more good people than bad people in the world. Only 19% of Americans think that people tend to be bad. 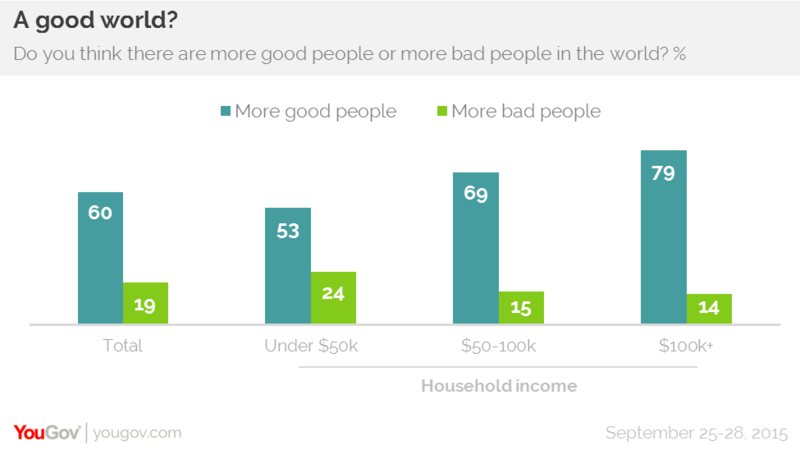 Poorer Americans are, however, noticeably less likely than richer Americans to say that there are more good people than bad people in the world. While 79% of Americans with household incomes over $100,000 say that the world is generally good, only just over half (53%) of Americans with incomes under $50,000 say the same. When it comes to their own morality, most Americans (51%) say that they are morally better than the average American. 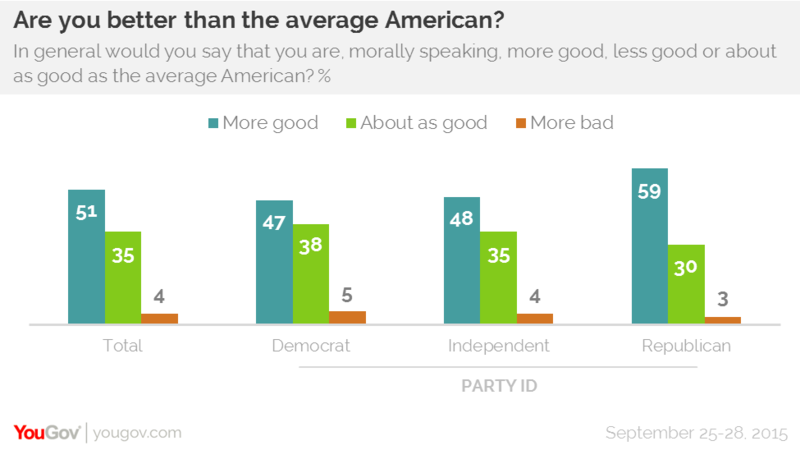 Republicans (59%) are more likely than either Democrats (47%) or independents (48%) to say that they are &apos;more good&apos; than the average American. 32% of both the British and American public say that some people are just born evil. Germans, however, are much less likely to believe some people are inherently evil, with only 15% of the German public saying that some people are born evil.